As traditional carbonated soft drink sales continue to lag, the convenience store channel is proving a hot bed for new beverage options sought by younger consumers, including healthier craft sodas and cold brew coffee. Industry experts say Millennials are leading the escape from mass produced, over-processed and over-packaged foods with a demand for real, healthier ingredients. The same can be said for U.S. packaged beverages, according to Gary Hemphill, managing director of research for Beverage Marketing Corp. (BMC), who explains the marketplace is being reshaped by consumer demand for variety and healthier refreshment. Due to this, retailers are likely to continue to see more category and product innovation. “It is fair to say that Millennials are leading the charge toward healthier refreshment beverages with products that are more natural and simple with a straight-forward list of ingredients,” said Hemphill. If that push from younger U.S. beverage consumers is growing, it’s reflective in the mixed sets and product lines displayed in c-store cold vault spaces throughout the country. The packaged beverage category is a perennial performer in terms of positive gross profit dollar growth. In 2016, packaged beverages (non-alcohol) accounted for 18.5% of gross profit dollars. Within the category, enhanced water (12.3% increase in sales), sports drinks (4.5%) and bottled water (3.9%) led sales growth from the cooler, according to data from the National Association of Convenience Stores (NACS). For the first time in 2016, bottled waters surpassed carbonated soft drinks to become the No. 1 beverage by volume. The BMC projects sparkling water sales will increase more than 20% in 2017. As U.S. consumers shun traditional carbonated soft drinks (CSD) in an effort to live healthier lives, Coca-Cola, PepsiCo and other drink manufacturers are pushing to pad their product portfolios with beverages with less sugar and what are considered “better-for-you” ingredients. For instance, Monster Mutant ‘super soda’ is an extension of a strategic partnership between Monster and Coke. Coke in 2015 acquired a minority stake in Monster and became “preferred global distribution partner” for Monster energy drinks. However, Mutant isn’t marketed as an energy offering, but is being peddled as a CSD alternative. Meanwhile, the new Monster Hydro will target active consumers and be positioned as an alternative to enhanced waters and sports drinks. The better-for-you movement is right in step with the convenience chain Maverik Inc., which touts the great outdoors in much of its promotional campaigns. Based in North Salt Lake, Utah, Maverik operates more than 270 stores across 10 western states. 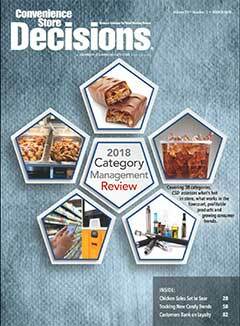 Mark Keller, Maverik’s category manager, packaged beverages, said the c-store’s evolving packaged beverage offerings seem to reflect such demand for diverse and natural offerings. “We are seeing growth in water, functional, tea, CSD and energy. CSD and energy are having to move to this space, while other sub categories are growing as consumers look for a more natural hydrating and beverage experience,” said Keller. For health-conscious Millennials monitoring their calorie intake and looking more closely at nutritional labels, craft sodas are helping entice more consumers back to the soft drink category. As result, demand is driving more product diversity. Craft sodas are also grabbing more market share in c-stores, slowly but surely. Chet Cox is president of Henderson, Nev.-based Get N Go—a burgeoning convenience chain that sells a lot of packaged beverages. When the weather turns hot, packaged beverage sales in the convenience channel can go off in different directions, depending partly on demographics. Cold brew coffee has grown in popularity over the last several years, and 2017 should be no different. Cold brew sales rose an astounding 580% between 2011 and 2016, according to Mintel’s 2016 U.S. Coffee Report. The cold brewing process uses time, rather than heat—soaking beans in water for 12 hours or more in order to turn water into coffee. Some of the brands growing in popularity include Califia Farms Cold Brew Coffee, High Brew Coffee and Stumptown Cold Brew Coffee. Because cold brew coffee is a smoother, less acidic product than traditional ready-to-drink coffee, Hemphill said the BMC feels the segment is likely to continue to grow along with the overall ready-to-drink coffee segment. It might take some time, however. At Team Oil Travel Center in Spring Valley, Wis., cold brew coffee isn’t new, nor does it do gangbusters. Major cities that are running low on municipal services seem to be gravitating to tax proposals on sugary beverages. The Seattle City Council recently approved a 1.75 cents per ounce tax on soda and other sugary beverages that are most popular in that city’s c-stores. The tax does exclude diet drinks. Businesses and labor groups have spoken out against the tax, saying it would hurt small businesses and cost jobs in Seattle. Other major cities that approved taxes on sugary beverages include Philadelphia, San Francisco and Oakland. Analysis from Nielsen Product Insider, via Label Insight, shows the beverage tax in Philadelphia has resulted in a 25.7% year-to-date (YTD) decline of taxable beverage sales since the tax went into effect on Jan. 1, 2017. On the other hand, tax-exempt beverage products in Philadelphia saw sales rise 6.1% in the same period. Soft drinks have been impacted, with share declining 5.7 points compared to the previous YTD period in 2016 (down from 23.6% to 17.9%). Water, however, has gained 5.3 share points (up from 18.8% to 24.1%) during the period.